In my history of science fiction series I have paused to consider early science fiction films. 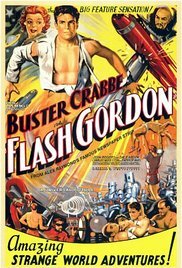 Flash Gordon (1936) was a serial film of a comic strip. First published January 7 1934, the strip was inspired by and created to compete with the already established Buck Rogers adventure strip, published since 1929. Flash Gordon is regarded as one of the best illustrated and most influential of American adventure comic strips. Three earthlings visit the planet Mongo to thwart the evil schemes of Emperor Ming the Merciless. A rogue planet is rushing madly toward the earth. Impending doom creates worldwide pandemonium. But maverick scientist Dr Zarkov hopes to stay disaster by travelling to the new planet in his experimental rocket. Two chance-met strangers, athletic Flash Gordon and damsel in distress Dale Arden, go with him. When they arrive, the trio find Mongo to be a planet of wonders, warring factions, and deadly perils, its orbit controlled by Emperor Ming who has his own sinister plans for earth. Foiling Ming’s plot against Earth, the heroes travel to the forest kingdom of Arboria, ruled by Prince Barin; the ice kingdom of Frigia, ruled by Queen Fria; the jungle kingdom of Tropica, ruled by Queen Desira; the undersea kingdom of the Shark Men, ruled by King Kala; and the flying city of the Hawkmen, ruled by Prince Vultan. They are joined in several early adventures by Prince Thun of the Lion Men. Eventually, Ming is overthrown, and Mongo is ruled by a council of leaders led by Barin. 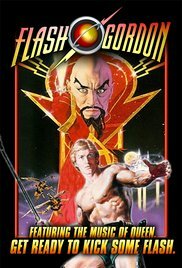 Other Flash Gordon serial films and compilation films appeared. The best-known version is the 1980 film which featured a soundtrack by Queen and sets which were a faithful homage to the original 1930s strips. Flash Gordon was also an influence on early Superhero comics characters. Jerry Siegel and Joe Shuster based Superman's uniform of tights and a cape on costumes worn by Flash Gordon. Bob Kane's drawing of Batman on the cover of Detective Comics No. 27 (the first appearance of the character) was based on a 1937 Alex Raymond drawing of Flash Gordon. Dennis Neville modeled the comics hero Hawkman's costume on the ‘Hawkmen’ characters in Raymond's Flash Gordon comic strip.